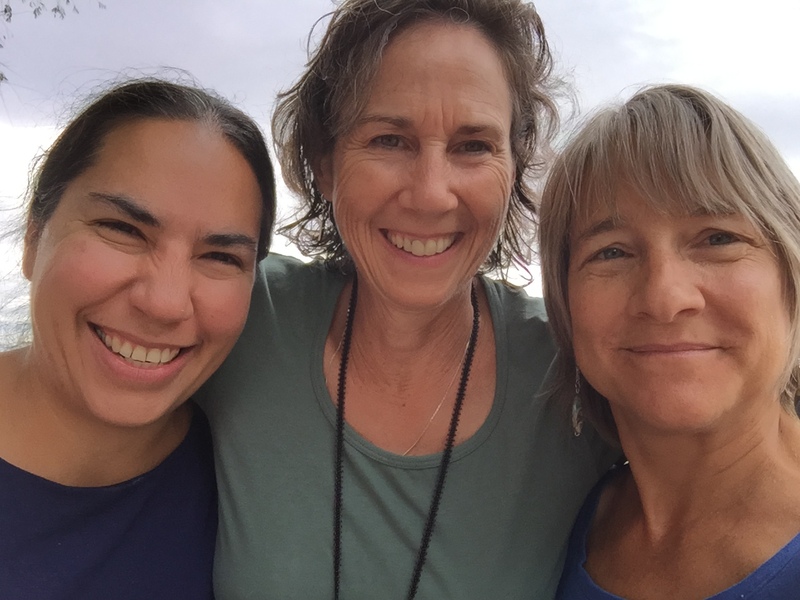 Anita Amstutz (center) with Sarah Augustine (left) and Sheri Hostetler (right). Anita Amstutz is an ordained Mennonite pastor and beekeeper, currently working on a grant funded writing project about bees. As a pastor and a beekeeper, the parallels drawn between the two is often raw and real. Recently, a lesson unfolded in my beehive, which took me back to the stories of the First Peoples who once lived uncolonized in North America. The lesson came two days after I returned from a long overseas trip to Palestine and Jerusalem. It was the end of November 2014. Heavy with jet lag and stories of occupation, I went out to check my beehives. It had been unseasonably warm while I was gone. I expected to see bees humming around the entrances. One of my hives was quiet. Below the door was a pile of beeswax. Something was not right. My stomach clenched. This was my mother hive. Upon opening the lid, and pulling out one bar after another, I began to realize that my hive had been “robbed” by feral bees — a chilling moment for any beekeeper. The hive had been invaded, and all the honey stored by my industrious bees for the winter had been stolen and carted off to another hive. My bees, helpless in the face of a stronger, more aggressive hive, could only watch as their winter stores disappeared. The hive looked like a ghost town. Not one drop of honey left. Not one live or dead bee remained. I was sick at heart. What had happened to my bees? Where had they been forced to go now that winter was coming? Had they all died? Where had they fled? And then it hit me with the brutal force of the stories, fresh in my mind, from Palestinian refugees. What is happening today in Palestine, has been happening in North America for centuries: Land seized. Dispossession. Endless occupation. Villages destroyed. Families separated. Children killed. Permanent refugees. Human rights humiliations. Genocide. Generations traumatized. My bees brought home this connection on a visceral level. It became my story. And so I began to research. The Indian Removal Act of 1830 became the Trail of Tears removing the southeastern U.S. tribes of Cherokee, Muskogee, Chickasaw, Chocktaw and Seminole Peoples west of the Mississippi. The Sand Creek Massacre of Cheyenne and Arapaho villages on the Great Plains was led by a Methodist preacher. The Long Walk of the Navajo in 1864 deported the Navajo by the government of the United States of America — forcing them to walk up to 13 miles a day at gunpoint in over 53 different forced marches from their reservation in what is now Arizona to eastern New Mexico. All told, North American Indians were reduced from an estimated population of 12 million in 1500 to barely 237,000 in 1900, representing a vast genocide in this country. And this is only a tiny slice of the horrors visited upon the inhabitants of this country after the Europeans arrived. My people, the Mennonites, were part of this westward expansion, dispossessing people who lived close to the heartbeat of the earth. My Mennonite ancestors were settlers. People of the plow, who broke the good soil of the prairie. They followed in the wake of the U.S. military, who carved a path of destruction and death through Native People’s villages, ending life as they had known it, forever. Mennonites became model farmers. Good citizens in their new home. They were Swiss, German, Russian, Dutch and of Eastern European descent — immigrants themselves from wars, religious persecution and dispossession in the Motherland. Mennonite Indian Schools in Canada and the U.S. stripped Native children of their language, identity, culture and familial ties. My Mennonite settler ancestors were part of stocking and staffing Indian Schools, created to chastise and assimilate the culture of First Nations People into a homogenous sea of white. In effect, it continued the traumatizing of generations of families and children. I am reminded that the cycle of trauma is endless until we awaken from our trance, a trance fueled by an economic and military engine that continues to cut a path of death, dispossession and destruction around the globe in service of little known, obscure 15th century documents collectively called the Doctrine of Discovery. This Doctrine was the child of a pre-Reformation, church-state alliance, set forth in the form of “papal bulls” and Royal Charters. It gave the church-state the right to seize any lands and natural resources it “discovered” and dispose the sovereign rights of the inhabitants living there. It is still alive and well today in North America, with rulings by the U.S. Supreme Court citing the Doctrine of Discovery as precedent as recently as 2005. The High Court still uses the Doctrine of Discovery to effectively legitimize dispossession of Indigenous lands for corporate profit, whether via whether mining, fracking, logging, water theft, plantation agriculture or other extractive industries. Perhaps the crows have come home to roost. It is a time of truth-telling both in my denomination and throughout the Christian church. Are we ready now to confess our ancestral complicity , make amends and hold our governments and churches accountable? If not, I fear the loss of our own collective soul as Mennonites and North American citizens, silent for so long. Spring will soon be here. I cleaned out my hive and will put a welcome mat at the door for the next generation of bees who will live in my devastated hive. It is the least I can do. I grieve their loss and my own impoverishment because they are no longer with me. I only hope that a new generation of bees will find my hive worthy of their noble presence.